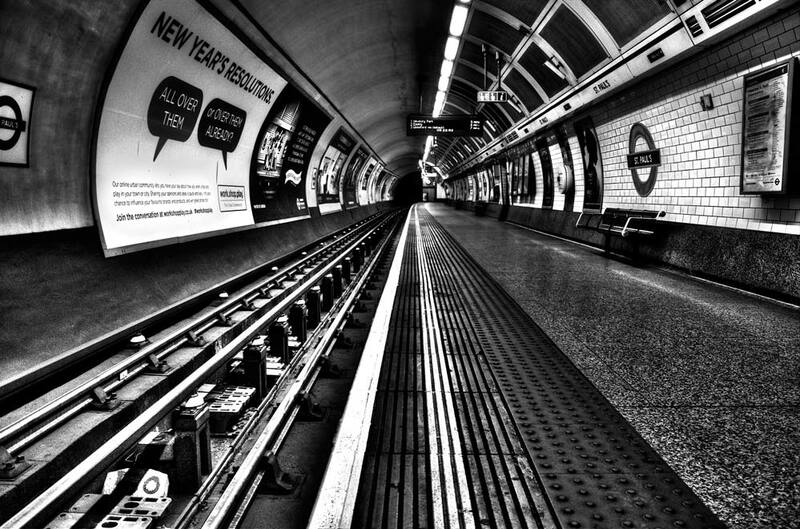 The London Underground (also known as the Tube or simply the Underground) is a public metro system serving a large part of Greater London and parts of the counties of Buckinghamshire, Hertfordshire and Essex. The system serves 270 stations and has 402 kilometres (250 mi) of track, 55 per cent of which is above ground. The network incorporates the world’s first underground railway, the Metropolitan Railway, which opened in 1863 and is now part of the Circle, Hammersmith & City and Metropolitan lines; and the first line to operate underground electric traction trains, the City & South London Railway in 1890, now part of the Northern line. The network has expanded to 11 lines, and in 2012/13 carried over 1 billion passengers. The system’s first tunnels were built just below the surface using the cut and cover method. Later, circular tunnels – which give rise to its nickname the Tube – were dug through the London Clay at a deeper level. The early lines were marketed as the UNDERGROUNDin the early 20th century on maps and signs at central London stations. The private companies that owned and ran the railways were merged in 1933 to form the London Passenger Transport Board. The current operator, London Underground Limited (LUL), is a wholly owned subsidiary of Transport for London (TfL), the statutory corporation responsible for most elements of the transport network in Greater London.